Sliding Rack Tray With Universal Equipment Fixing Points. Can this be mounted in a rack with 33" depth? Penn Elcom Online Replies: Hi, unfortunately this product cannot reach a 33" depth. The maximum distance that the front and rear brackets can be set to is 29". Can it be mounted upside down to accomodate a console that is 17.5" wide and work normally? Penn Elcom Online Replies: Thank you for the question. Yes this track tray can be mounted upside down to provide more surface area. Does this product have a catch or latch to positively hold it in the closed position? 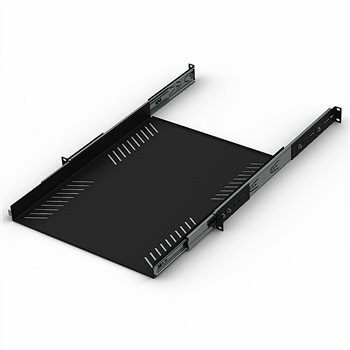 Penn Elcom Online Replies: The R1290 rack trays have a soft close on the runners that hold the tray in position. It doesn't however operate as a hard close so if the tray is tipped/pulled it will release. Penn Elcom Online Replies: The weight of this product is 4.58kg / 10lbs.